Disability rights campaigners who say the assisted suicide policy in England and Wales is too "liberal" have lost a High Court legal challenge. The director of public prosecutions amended assisted suicide guidelines last year to allow more discretion about when to bring criminal charges. Nikki Kenward, who is paralysed, and her husband, argued it meant doctors were less likely to be prosecuted. Judges rejected their application to quash the amendment. They unanimously ruled that the challenge lacked merit. In England and Wales, the Suicide Act 1961 makes it an offence to encourage or assist a suicide or a suicide attempt, with a maximum sentence of 14 years in prison. In October last year, Director of Public Prosecutions Alison Saunders amended an element of the guidelines around the act, which had stated that a prosecution was more likely if the suspect was a healthcare professional. BBC legal correspondent Clive Coleman said that, for example, previously a healthcare professional who helped a friend to die would be more likely to be prosecuted simply because of their profession. The change means they would be more likely to be prosecuted only if they were in a relationship of care with the victim, and may have exerted some influence, he said. Mr and Mrs Kenward argued the guidelines had been amended in a flawed and "whimsical" way. Supported by the Christian Legal Centre, they said the amendment would make it easier for healthcare professionals to avoid prosecution. Former theatre manager Mrs Kenward is in a wheelchair after she developed Guillain-Barre syndrome, a rare and serious condition of the peripheral nervous system. She had argued the change to guidelines could "change how we view death", and create "a new mean whereby euthanasia is an accepted form of behaviour"
High Court judges Sir Brian Leveson, Mr Justice Wilkie and Mr Justice Cranston unanimously ruled the legal challenge lacked merit and refused to quash the amendment. Reacting to the ruling, Mr and Mrs Kenward said they intend to appeal against it "on behalf of the disabled, elderly, terminally ill and others who are vulnerable". "This area of law is a matter of life and death. How can we be sure of proper protections if the goalposts can be moved, on a whim, five years down the line, without consultation?" Mrs Kenward said. "People need to be able to trust that doctors will always protect life, not help to take it. This change undermines that trust. It is liberalisation by the back door." Andrea Williams, chief executive of the Christian Legal Centre, said they would support the Kenward's appeal to ensure that "essential safeguards aren't eroded". 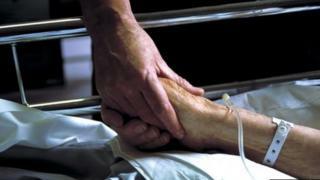 Assisted dying: What do disabled people think?